Winter has come to Key West.. Winter fishing is great. January 27th 2019 – I don’t need to tell the folks up North that winter has come that’s for sure. But as I write this on my back porch over looking the canal and see the weekend boaters head out in the balmy 74 degrees with 85% humidity I’ll say, here in Key West from time to time it’s hard to tell if its winter. Well, not this past week. All last week we had all the ingredients of a Keys winter and maybe a little more. Temps steady in the 60s, Winds from the North and North East from 15-30 and some rain. Nice!… well, not so much but we will get through it. It looks like Mother Nature may let her grip up a bit these next 10 days or so and give us that famous Key West winter that everyone up North will come down and say.. WOW! 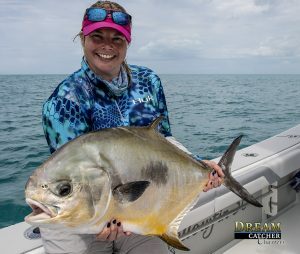 Rebecca is holding up a nice permit she fought in the pouring rain fishing with Capt. Steven Lamp at Dream Catcher Charters. The fishing report this week is kinda slow. Only because lots of Key West fishing guides were pinned down by wind or cold and not able to get out and do what they do. However there were some good reports even in spite of the weather. the blackfin tuna bite was very hit or miss. The sailfish action was almost decent with a few sails caught in the last few days by our Deep sea fishing guys. I think the best action offshore was the patch reefs where guys were hiding from the winds and trying to make a day of it catching a few mutton snappers, kingfish, cero mackerels and yellowtail snappers. I think things were a bit better with more places to hide from the elements. The trout fishing was as strong as it has been. We did get some reports of a couple tarpon lurking around, even in the cold, but I wouldn’t bank on it daily just yet. (Check out the tarpon fishing reports) The big things we have been seeing are jacks, ladyfish, trout, bluefish, barracudas and sharks.. The weather is going to straighten right up as of tomorrow (Monday January 27). We hav a good long stretch of great weather coming to Key West with mild temps and light winds. The fishing will remain the same but accessibility will improve. We will be able to get folks out to our good fishing grounds without watching them toss cookies. Favorable winds for sailfish along the reef with the possibility of some winter dolphin fishing when the winds come out of the South Easterly directions. Reef fishing we can expect the kingfishing, blackfin tunas to continue and the snappers will most likely turn on real hard while the water clears up then get back to normal when the water quality settles. I am really looking forward to the better weather to run West again with my anglers on my 36′ Yellowfin to go shallow water wreck fishing for Cobia, permit and the smorgasbord of fish that we catch out there. This is a great time of the year for that sort of trip. I call it my offshore “All In Wonder“. With the more stable weather patterns prevailing late January into February is a great time of the year for our shallow water fisheries. Flats fishing is pretty good on the warmer days for species such as Permit and the possibility of some laid up tarpon. Mostly though folks will want the comfort of a bent rod and drag burning on light tackle with the numerous species that are found in and around the backcountry waters of Key West. Cobia are certainly one of the species I would keep a sharp eye out for this time of the year in the backcountry and on the flats since we have had a decently cooler winter. This is the start of the Key West tourist season. Now is the time the hotels fill up, rates go up and things get busy. If you re looking to book fishing charters do it sooner than later this time of the year to get the best of who is available.